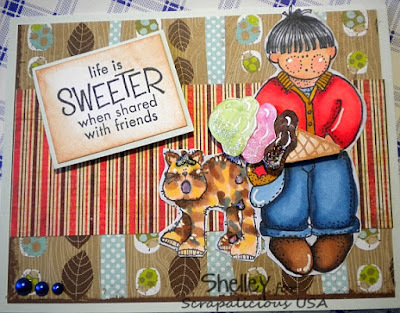 Shelley Bean: Scrapalicious Challenge-Cold Treats! Howdy and welcome to another Scrapalicious USA challenge! Sorry I have not been around much but I have been lucky enough to have my home filled with company and preparations for a family reunion this weekend. Needless to say, my crafty ambitions have been thwarted. I will be back though! I used some of the fabulous paper available for sale at Scrapalicious! 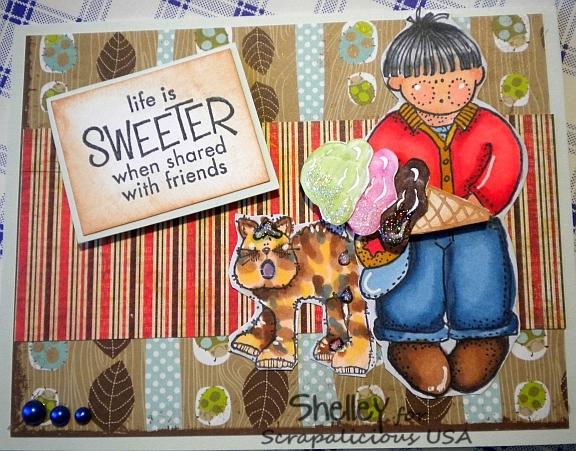 I had some older stamps available that I sort of pieced together to create the scene of the kitty getting his fair share of a cold treat. Items used will follow post. I think it's about time I did some more copics tutorials. Any special requests? Drop me a line or leave a comment below if you have an opinion about that. But for now, I have a special tip for you. Do you want the 3 perfect Copics colors to create denim blue like the ones in the card above? I used B97, B95, B91. Give it a try!! Please join us at the Scrapalicious blog for this fun challenge. And take a minute (you will really want an hour) to browse through the vast selection of fantastic scrapbook supplies available for sale at the Scrapalicious USA store. Layout Challenge at Paper Patch Crafts!